Every time I do a Memory Lane post, I have to hang my head in disappointment at how inadequate my notes are. For example, with Mardi Gras Mold, the recipe calls for “1 package (3 oz.) 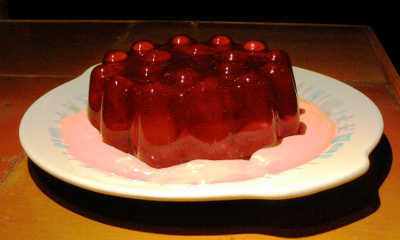 Jell-O Gelatin, any red flavor”. I neglected to note which red flavor I used, and it’s weird, now, how frustrating that is. I mean, that’s not an unimportant detail. The difference between strawberry, raspberry and cherry Jell-O is actually significant. No, really, it is. This is one of the sucky things about closing in on 50. I’ve been aware for quite a while that time speeds up as you get older, but it’s only now that I’m getting a sense of how little time I have left, and how little I’ve done with what I’ve had already. Now, sure, 50 isn’t all that old. It’s still safely within the zone of “middle age”. The problem is that most of the interesting stuff is meant to be done, or at least started, when you’re young, when you have peak energy and stamina, and joints that function silently without calling attention to themselves. According to The Life Script™, I’m supposed to be starting to bask in the glory of all that I’ve accomplished throughout my lifetime, receiving a chair or other token for career longevity, and having young grandchildren stay for sleepovers in my spacious suburban abode. Well, I don’t have a house with spare bedrooms. I don’t have children (so no grandchildren). Thanks to a layoff and subsequent cross-country move, I’m not in MIT’s Quarter-Century Club (though I would be by now if things hadn’t gone a bit pear-shaped in 1998). I do have loads of memories and experiences – marriages, and travel, and getting to know some really excellent people. There’s still more, though, I know it. I’m not sure what I did with my copy of The Life Script™. Most likely I left it behind at my father’s house when I moved out to go to college, along with a bunch of other stuff I didn’t care about. I’ve never missed it, particularly. I suspect that following it would have made me at least as miserable as it seemed to make my parents, especially since I’ve known from a young age that I want to live a less conventional life. It’s been an interesting 49-and-some years, but the “mid-life crisis” is a boring cliché for a reason. Everyone hits this point and thinks, “What’s next?” I don’t even have a blueprint for it, and letting things happen, as I’ve done all my life, seems rather counterintuitive at this stage. They say that the unexamined life is not worth living (hell, I’ve said it, and then gotten blamed for inspiring mayhem) but the examined life is certainly the longer, bumpier path. According to my notes, Mardi Gras Mold did not taste of regret. (No, that would be Jellied Prune Whip.) In fact, I indicated that it “seems not unpleasant”. My only specific memory of it is that it was the start of me getting over a lifelong dislike of maraschino cherries. The recipe calls for a third of a cup of the buggers, diced, and while it’s not exactly ham-and-egg-in-Jell-O, I’m sure I had to gird my loins for this one. In fact, at the top of my notes (from when I was just starting to make the recipe) is the comment “Not enough maraschino cherries – so what?” My very last comment was “I wish I’d had enough cherries…” So there you go, a little bit of proof that growth and change are possible as we get older. As you can see from the photo, the top layer is straight red gelatin, and the bottom layer is a bavarian. In this case, the recipe gives the option of using either Dream Whip or whipped heavy cream. (I went with the Dream Whip. Why? I don’t know…) Suspended in the bavarian layer are the above mentioned diced maraschino cherries and a quarter-cup of slivered blanched almonds. My notes say that “something is missing…”, but also that “nuts do not belong in Jell-O”, which seems pretty obvious when you think about it. Like many of these layered desserts, the layers did not adhere well, which I attributed to the fact that the bavarian layer seemed to contain a large proportion of Dream Whip. Bryan enjoyed playing with it, though, and the flavor wasn’t too bad, so we gave it two “nasties”. With this one, I felt like I was finally doing something right – until I learned that today is National Ice Cream Day. Fresh Strawberry Pie is the sort of no-bake dessert that uplifted the spirits of 1970s moms. Central air conditioning was less common in homes then than it is now, so summertime cuisine was heavy on things we think of as picnic or cookout food – salads instead of cooked vegetables or hot pasta dishes, potato chips instead of mashed or French fried potatoes, meats cooked outside on the grill (by Dad, usually), and of course no-bake desserts. Anything to avoid heating up the kitchen, which I understand completely because Freak Mountain has no air conditioning of any sort. The crust can be either a regular pie shell or a crumb crust, and when temperatures are in the 90s Fahrenheit (30s Celcius) as they’ve been this weekend, bashing up some cookies and mixing them with melted butter is a damn good option. I was going to make a chocolate crumb crust using Nabisco Famous Chocolate Wafers and Nilla Wafers per Mother Wonderful’s Cheesecake and Other Goodies (my go-to cheesecake recipe book for the last 25 years) but while we were in the supermarket I gave in to the temptation to try a crust made with Oreos instead, because that seemed like it would be more true to the Project somehow. It turned out really well. The main problem was that I only needed two thirds of the package of Oreos for the crust, leaving a third of a package of Oreos for, well, lunch. Okay, I didn’t eat all of them, and I ate them with the leftover strawberries, so that cancels out some of the calories, right? 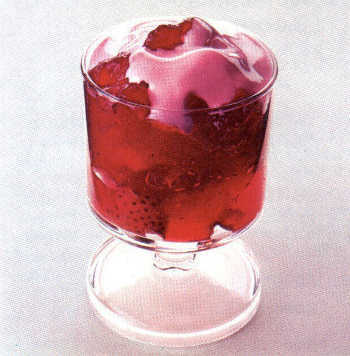 Heat like we’ve been having this weekend seemed like it might make the Jell-O part a little trickier. The pie filling goes in two parts, a Cool Whip bavarian made with half of the Jell-O that goes on top of the crust, and then the remainder of the Jell-O combined with fresh strawberries which goes into the middle of the pie. I used the ice water bath technique to thicken the bavarian part (another reason this recipe is nice to do in hot weather) but it wouldn’t thicken up to the “mounding” stage for some reason. I thought maybe it had to do with the heat, since the ice was melting quickly in the water. Should I have used more ice? Salted the water? Anyway, it didn’t work as described in the recipe, but it worked well enough. One odd addition to this part of the recipe is red food coloring. The recipe calls for a few drops, so I added four. It made absolutely no difference whatsoever. Now I’m getting chills thinking of all the kids of my generation who unwittingly ingested an unnecessary dose of Red Dye #2 with this. The Jell-O/strawberry part (thickened over a fresh ice water bath) went just the way it was supposed to and ended up floating nicely on the bavarian in the center of the pie. I seem to be developing the habit of going to the gym to lift before tasting my Jell-O creations so that I come at them hungry. That probably wasn’t necessary with this recipe, but it certainly didn’t hurt (especially after all those Oreos I ate yesterday). The bavarian part firmed up more in the refrigerator overnight, so I was able to get a fairly clean slice. Since I had leftover Cool Whip, I decided to garnish my slice with one of those famous Cool Whip dollops – and discovered that it was softer than Cool Whip should be. Aha! Maybe the bavarian’s refusal to set up completely wasn’t my fault after all. For eating, this is reasonably pleasant. I think I’ve remarked before that strawberry is one of the less offensive artificial flavors, and it goes well with cream, even fake cream. The real strawberries make the whole thing more refreshing. My main quibble is that the Oreo crust is too sweet, but that’s totally my fault. (And Bryan remarked that it seems silly to complain that the cookie crust of your Jell-O pie is too sweet.) I would go for the wafer cookie crust if I was going to make this again. To be honest, that’s unlikely, given how nutritionally questionable this is, but I do think we’ll end up eating all of this particular pie. It’s National Eat Your Jell-O Day! Procrastinator that I am, I left doing something about it until the last possible moment, and yesterday after work as I researched National Eat Your Jell-O Day, I discovered that the reason it’s on July 12 is that July 12 is Bill Cosby’s birthday. I think we’d all rather not make that association anymore. Still, if you google “National Eat Your Jell-O Day”, it’s in all the calendars for July 12, and we can’t just go around changing all the calendars on the internet now, can we? I say we just re-claim this holiday, treat the day as though it were based on, say, the Mayan calendar. (Let’s not make it a lunar holiday, though. Then it’ll keep moving around and we’ll never be able to keep track of it.) Let’s make it all about the Jell-O, because that’s what’s important. So in honor of National Eat Your Jell-O Day, I decided to put up a little New Joy of Jell-O retrospective. Jell-O has changed my life in some weird and interesting ways. For those of you who haven’t read the “About the Project” page, I started this blog on a dare. I had been grumbling at length to Bryan about Julie Powell’s success with her Julie/Julia Project blog after we saw the movie Julie and Julia. (Okay, I admit it, I was jealous.) Thinking he’d get me to shut up about it, when we got home he said I should start my own though-cooking blog, and he pulled The New Joys of Jell-O from our bookcase full of cookbooks and handed it to me. I don’t think he really thought I’d do it. Considering that by that point he’d known me for over twenty years and married me twice, you’d think he would’ve known better. I have absolutely no idea what this is. Looks purty, though, don’t it? I mean, it didn’t seem like it would be that hard. Depending on how you count, there’s a little over a hundred recipes in the book. And it’s Jell-O, ferchrissakes! Cafeteria food! Sick-day food! It’s the easiest bloody dessert to make in the world after cut-up fruit! It turned out that two Jell-O dishes per week, plus the photography and writing (in addition to work, fitness activities, and other life things) was a bit much. Strange as it sounds, I got burnt out on Jell-O. Even stranger, though, was the way that the Project haunted me. For four years it haunted me, until some friends convinced me to restart it. Even with a proper editorial calendar and careful pacing, it hasn’t been totally smooth going, but I finally feel like I’m on track to see this thing through to the end. I like that the New Joy of Jell-O Project gives my life a sort of weird, random purpose, and it feels good to be writing regularly, getting a little creative, and stretching a bit into visual arts. Happy National Eat Your Jell-O Day! First of all, I have to apologize for the photo. The color balance on this was very difficult to get right, between the red Jell-O and the terra cotta tiles and the fact that I can’t be arsed to learn what all those little glyphs mean on my camera’s menus so that I can make those adjustments there. I have a cunning plan to “borrow” a light kit that Bryan and I bought for his mom for Christmas a year or two ago so that she could take good photos of the jewelry she was making. She’s since moved on from jewelry to knitting and has hardly used the kit, so we don’t think she’ll miss it. The recipe doesn’t require that it be molded, as you can tell from the photograph from the book, but it’s given as an option that I thought I ought to take considering how badly I need to practice the technique. I’m happy to say that this went much better than the Jellied Ginger Upper. I had my towels all in place (and we all know how important it is to keep track of your towel) before the unmolding, and I found that it helped to watch the Jell-O around the sides of the mold – it starts to look kind of “melty” when it’s ready to go, and in fact I probably could have kept it in the warm water for a second or two less. I was satisfied with this result, though, and am feeling at least a little more confident about making a mold for the Halloween party. If only I was as sanguine about a costume.